Originally recorded in 1959 by Barrett Strong, Money (That's What I Want) was the thrilling closing track on The Beatles' second album. First released in August 1959, Money (That's What I Want) was written by Tamla founder Berry Gordy and Janie Bradford. In June 1960 became the first hit record for Gordy's Motown label, having previously been a hit in the midwest. The single reached number two on the US R&B chart and number 23 on the pop chart. Brian [Epstein] had had a policy at NEMS of buying at least one copy of every record that was released. If it sold, he'd order another one, or five or whatever. Consequently he had records that weren't hits in Britain, weren't even hits in America. Before going to a gig we'd meet in the record store, after it had shut, and we'd search the racks like ferrets to see what new ones were there... Devil In Her Heart and Barrett Strong's Money were records that we'd picked up and played in the shop and thought were interesting. The Beatles' version of Money (That's What I Want) was a clear attempt to emulate the success of Twist And Shout, the show-stopping finale of Please Please Me. The Beatles took Strong's original and lowered it from the key of F to E, added a searing vocal from John Lennon, close harmonies from Harrison and McCartney, and turned it into a thundering powerhouse. Much of this was down to the climactic final chorus, driven along by Ringo Starr's eight-to-the-bar bass drum – a sound which would soon become characteristic of early 1960s beat music. The cover songs recorded for With The Beatles were chosen by whoever liked them. It was interesting that when I joined The Beatles we didn't really know each other, but if you looked at each of our record collections, the four of us had virtually the same records. We all had The Miracles, we all had Barrett Strong and people like that. I suppose that helped us gel as musicians, and as a group. Lennon's cry of "I wanna be free" was from the heart: after many long years on the road, and despite the promises of greater riches in their sights, The Beatles nonetheless anticipated their success only lasting a short time in the early 1960s – a typical career for pop stars at the time was just a few years. When it looked as though they would enjoy more lasting fortunes, McCartney countered Money's desperate materialism with Can't Buy Me Love. In later years McCartney would lament the way that Lennon tended to be viewed as the Beatle with the rock 'n' roll edge. This song, along with Twist And Shout and Dizzy Miss Lizzy, showed precisely why. Although McCartney came close, most notably on Long Tall Sally, Lennon got there first, and in 1963 audiences had heard nothing like this before. The Beatles first recorded Money (That's What I Want) at their audition for Decca Records on 1 January 1962. Although the music lacked the primal energy of the Abbey Road version, it nonetheless featured a powerful vocal from Lennon. The group also recorded the song six times for BBC radio. The first attempt was on 21 May 1963 for the Saturday Club programme, which was recorded at the Playhouse Theatre in London and first broadcast four days later. They returned to it on 1 June, for the third edition of Pop Go The Beatles. This show was recorded at the BBC Paris Studio, London, and first heard by radio listeners on 18 June. This was the first recorded instance of Lennon exclaiming "I wanna be free!" in the final verse. The Anthology 1 album contains a live version of Money, recorded on 24 October 1963 at the Karlaplansstudion in Stockholm, Sweden. This show was broadcast live on Swedish National Radio on 11 November that year. The only known live performance on film was captured during the UK television special It's The Beatles. It was filmed at Liverpool's Empire Theatre on the afternoon of 7 December 1963, and screened by the BBC later that evening. The Beatles recorded Money (That's What I Want) in seven takes, on 18 July 1963. Twelve days later, on 30 July, George Martin added the song's piano chords. The piano overdub was completed in seven attempts, numbered 8-14. An edit of takes six and seven was made on 21 August, from which a mono mix was made the same day. George Martin recorded more piano overdubs on 30 September, while The Beatles were holidaying abroad. Stereo mixes were made on 29 and 30 October, ahead of With The Beatles' 22 November UK release. I read in on of those unauthorized fan books “Treasures of the Beatles” that Martin played the guitar in this song… I’m wondering if they meant to write piano in the book? I wouldn’t see why they would need him to play the guitar. Regardless love this website and check on it regularly! Thanks Joe! Years ago, I remember hearing a mix of Money in which the bass comes in just before the end of the first line of the piano intro. George M plays DA-da-da-da-DA da-da-DA da-da-DA, and then Paul’s bass plays the next three notes with the piano before the first note of the second line of intro (ba-ba-ba BOOM), which is different from the standard mix. Does anyone know what I’m talking about? It’s a brilliant cover, but bringing in the bass just a touch earlier seemed to make it even better! The line is NOT “I wanna be free”, it’s “all that ‘lean green'”… Barrett Strong does it in the original, also. sorry John deviates from the song and it is i wanna be free. have heard the origional but this song just ROCKS. one of my fav Beatles tunes. really love George Martins piano and Harrisons guitar. I definitely hear the word “green” at the end, though I can’t understand the previous words. I never heard it as “I wanna be free”, and still don’t. One of my favorite Beatles covers, and a fantastic rip-roaring closer to With The Beatles. If you listen closely to the solo, there’s a great McCartney scream buried way in the back. Brian Epstein wouldn’t let the Beatles move on stage. That was for the Stones. Brian, with his theater background, also made them give those deep bows after every song. Another way they were differentiated from the more sexual Stones. John said by the time they got to America, the music was dead. Brian killed it with the suits and strict rules. The Beatles weren’t always forced to act like mannequins. In Germany they moved and gyrated. Bruno Koschmider their Hamburg impressario demanded it. “Mak show Beatles!”. The stronger the stage act, the more the kids, gays and sailors would drink and stay to watch the group. Personally, I think BE was correct in how he wanted the band to behave on stage. You have to remember that, at the time, this music (performed by white musicians with electric guitars) was outrageously new. Had the Beatles not demonstrated a kind of respect for the audience (via the bow) or moved like Elvis (or MJ or EB), they would have had a much more difficult time winning America. As it was, the KKK wanted to burn everything Beatles-related including the boys themselves. It was a sad fact in those days that they had to present themselves as perfectly “respectable” or it would have made their acceptance in the USA much, much more difficult. Normally when Paul and George do backing vocals, Paul’s voice dominates, but on the ‘With The Beatles’ version of this, George’s voice is more prominent, maybe because of subject matter engaged him (think Taxman)? To me, this the ultimate early Beatles raver, better than “Twist and Shout” and Long Tall Sally”. Ringo’s beat is relentless, John is just out of his mind in the last 2 choruses, and listen to Paul’s Little Richard high harmony on the very last “that’s what I want” background vocal….doesn’t get better than that. This is one of my favorite tracks off “With the Beatles “. John Lennon’s vocal is amazing. 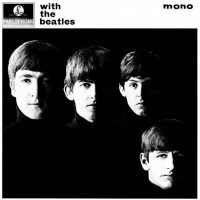 It is another great cover and brilliantly finishes off “With the Beatles” the way “Twist and Shout” does “Please Please Me”. The EMI version of “Money” completely blows the Decca audition version out of the water!!! The January 1962 recording is very stiff. Definitely a weaker moment of the audition. John’s vocals seemed to be mastered at an incorrect speed, and he sounds like he’s a chipmunk!! That’s because Pete Best was their drummer on that Decca Audition. Ringo’s drumming was more lively & prominent alternately filling in some toms unlike Pete’s doing just straight drumming. Although the version on With The Beatles album was much slower, it is clearer & snappier than that on the Decca tapes. John Lennon’s vocals coupled with George Martin’s brilliant piano intro, make this one of The Beatles great covers. Definitely one of the greatest of the group’s cover versions. This song was also covered by the Rolling Stones.